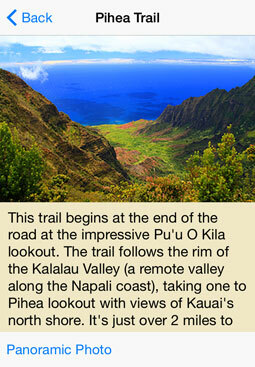 The Kauai GPS Tour Guide is a virtual tour guide that talks to you as you drive around Kauai. The Tour Guide knows exactly where you are and alerts you to hidden beaches, scenic lookouts, historic sites, hikes, movie locations, farmers markets and many other Kauai attractions. "A forest trail beside the road here leads to Lumahai Beach..."
The Kauai GPS Tour Guide talks to you as you drive around Kauai! Over 200 points of interest. Comprehensive beach and snorkeling guides including maps. Discover walks, hikes, waterfalls, secret beaches and more. Regional weather and surf forecasts. Doesn't require cell phone coverage or data roaming. Listen to music in the background. The Tour Guide pauses music when she speaks. Works with navigation apps running in the background. Developed by island residents who know Kauai's secrets. The Tour Guide uses a human voice. 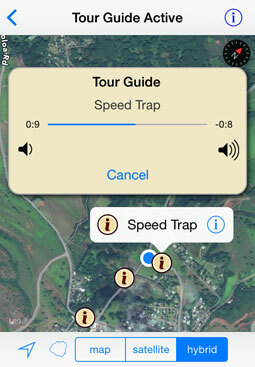 The Kauai GPS Tour Guide also contains a wealth of information. Lookup beaches, snorkel spots, hikes, and scenic attractions. An absolute must for any first time visitors! I was so impressed with this App. 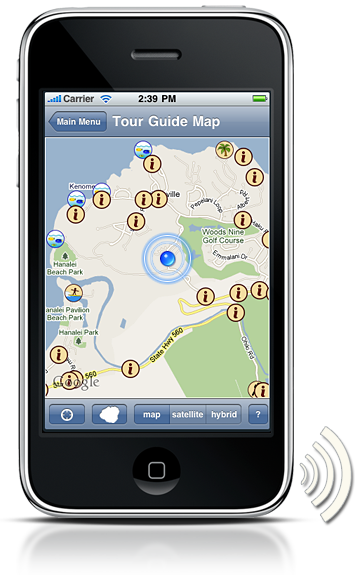 The Kauai GPS Tour Guide is the first and only App of its kind available to Kauai visitors. It's like having an island resident drive with you to tell you about the island. Unlike a guide book where you're constantly flipping through pages trying to figure out where you are and what's around you, the Tour Guide tells you about hidden places, and guides you to difficult-to-find attractions. The Tour Guide includes over 200 points of interest and uses a real human voice - not a computer generated one. The application also includes comprehensive beach and snorkeling guides, weather and surf forecasts, and Kauai background information for tourists including detailed ocean safety guidelines. The Tour Guide works without cell phone coverage. 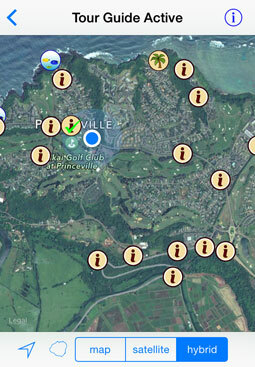 The GPS has clinical precision everywhere on Kauai. International customers can turn off data roaming. A network connection is used, when available, to update the map, but this map can be cached before heading out on a trip.